A dear friend, Patty Kelly (1933-2013), wrote to some of us around 2007 from the ashram of Bhagavan Sri Ramana Maharshi (1879-1950) about her and her husband John's practice of a particular form of “self-inquiry” or âtma vicâra (pronounced “vichâra”) as advocated, along with other forms of self-inquiry and pure Self-abidance, by the illustrious Bhagavan Ramana. Two of us local teachers were mentioned in passing in her letter, Robert Nickel (d.2012) of Ojai, and myself (Timothy Conway), along with two "famous" western teachers, whom our correspondent singles out but who will remain unnamed here. Our friend Patty wondered what Robert and I thought about the practice of self-enquiry and "stopping all thoughts at their root." Robert and I independently each felt moved by Patty's great dedication, sincerity, kindness and friendship to respond to her letter. My response is given first here (with a wee bit of editing in a few places for this web version), followed by Robert's wise response which adds his judicious quoting of some great sayings from the Maharshi and a disciple, Papaji of Lucknow. We thank our dear (late) friend Patty for her great, passionate commitment to Truth and her love for all beings. Thank you for your emails from HERE, in the form of Ramanashramam and the holy Mount Arunachala Siva. Glad to hear of your wonderful, idyllic time in Tiruvannamalai. On one level (the outer, "dream" level), it’s changed so much since some of us first began visiting decades ago, yet the spiritual Reality underlying and permeating the place (the city, the temple, the ashrams and the mountain) is ALWAYS THE SAME. Welcome to SAMENESS! 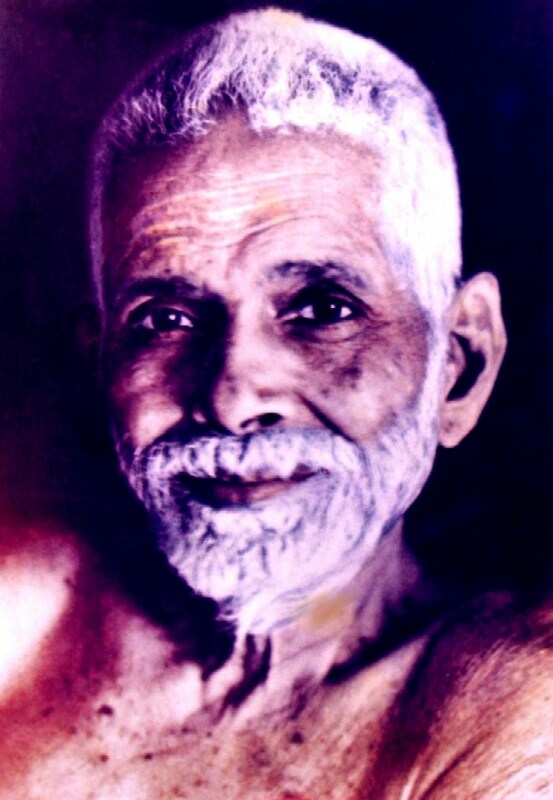 You wrote to your friends of your really lovely and deep practice of “self-inquiry” (âtma vicâra) as practiced according to one particular line of Ramana Maharshi’s teaching…. [My husband] John and I are practicing this: going from a thought immediately to, “to whom is this thought coming?”, “to me”, and then “who am I?”--and there is no verbal answer to the final question, it just takes you to the truth/self of peace and quiet. This practice is constant, until no thought gets a chance to take root, so it takes constant vigilance and an alert, quiet way of being. By the way, all of us are realized, so what we are really talking about is abiding in the Self. Somehow, I missed this very important information to stop all thoughts at their roots, and don’t feel [certain well-known teachers] get this across at all, at least to me. […] It may seem like a radical step to take, but we are convinced that there is no other way to make this shift, and make it NOW. I may not write again for awhile, as there isn’t much more to say, just wanted you to all know what an important trip and time of life this is for both of us, and how much we appreciate and love, yes--really love all of you. Thank you for your palpable and heartfelt LOVE, dear Patty. The simple point, which i’ve been happy to freely share with folks since the late 1970s is that, at the beginning of every moment, we are always absolutely free, undefined, unstructured, and thought-free. And then, voilà, a few milliseconds into many of these moments an old tendency of “egoic self-definition” seems to arise wherein we then take ourselves to be a narrow, finite identity, a “me,” a “somebody,” a “thinker, feeler, doer, reactor, suffering person, happy person, worldly-seeking or spiritually-seeking person,” etc. At other times, of course, especially in deep dreamless sleep but also during many moments of the day, such identifications or self-definitions don't arise and we simply are Being open, hosting Awareness while a personality functions in a natural, free-flowing fashion without constriction. The process of narrowly or “falsely” identifying with thoughts, feelings, postures and reactions (of desire-aversion) is a dream, occurring moment by moment by the thousands of moments each day, repeated every day and every lifetime by beings until they inquire into what is their Real Nature at the beginning of each undefined moment--that is, right NOW, before their mind and karmic tendencies and social conditioning all come together to create this sense of limited identity. So: to repeat, we are always and quite simply free, prior to the arising of this limiting identification process. This is not a matter of attainment or striving or effort. Our true Identity or Self is simply the absolute, infinite Being, Is-ness, Aliveness, Intelligence, Peace and Bliss. We are ALWAYS THIS simple, natural (sahaja) openness, this vastness, this no-thingness, this formlessness and changelessness of pure Divine Awareness (call THIS Awareness whatever you wish--Self, Spirit, Atman-Brahman, Paramatman-Parabrahman, Tao, Buddhata, Sunyata, Dharmakaya, Allah, Ain Sof, God--names don’t matter with respect to this Namelessness). We always abide and flourish as THIS, and thus there is no need for any kind of “hero’s journey” to “get there” (where could that “there” possibly be?) This great, glorious Reality is always HERE and always fresh, new and NOW, never “old” or “stale” or “boring.” And THIS is the very Source, right here and now, of the mind (thoughts) and body (sensations) and entire dreamlike world-appearance. In other words, THIS Reality of Pure Awareness is closer to you than your own mind or body or psychic self- or soul-sense. THIS is absolute Spirit, the Full-Void in which every thought, sensation, process, event, or whatever could possibly arise. Hence, one never need go in “search” of oneSelf. Your Infinite Divine Freedom is always immediately HERE, NOW, and quite real, not even needing to be “realized,” as Bhagavan Ramana so often said, for how can “you” (an ego sense, a pattern of psycho-physiological, mind-body events) “make real” what is already absolutely REAL as the Self-Reality (Atman-Brahman)? This basic, fundamental (emphasis on “fun”) truth of one’s real Awareness is so obvious--not objectively obvious, but Subjectively obvious-- when one stops searching for “it” as a phenomenon on the level of the mind. This is why Sri Ramana sometimes said, “Cease to be a knower.” Why? Because you can only BE this, not know “it” as an object. (Just as the fingertip is not designed to touch itself, Awareness has no need to “find itself” or “know itself” as an object.) If you want to “know objects,” just witness thoughts, sensations and any/all events on the level of body-mind-soul. The universe (on all levels) is the “body of God.” You, O Divine One, are formless Spirit, playing and displaying as the cosmos. This cosmic dream appearance--earthly plane or subtle or heaven planes--is all Thy dreamlike manifestation in form, O Formless ONE! (You, who are “no one” in particular, but everyone in Your all-embracing Love). Thus, there’s no “there” about the God-Self, only HERE. No “then,” only NOW. That is to say, ideas such as “I’m not yet realized” or ”I’ve not yet found God, but maybe one day in the future I’ll find the God-Self” or even the thought “I must get to the root of thoughts to be free of thoughts” --are all simply thoughts arising each moment out of your thought-free Infinity-Eternity. These thoughts are made of energy-vibrations--they have no intrinsic reality and, clearly seen as such, are harmless. They can only arise in and be witnessed by Your Real Nature, which is not a thought, but the great, glorious open Reality on “this side” of thought, i.e., their Hosting Witness. Your true Nature as Awareness or Atma-Self has thoughts, witnesses thoughts, and merges all thoughts back into the Open-Empty-Fullness of Awareness, but who you are as Atma-Awareness is not limited to being any kind of thought or thinkable entity. This Reality you ARE is simply too CHANGELESS to be a changing thought (an arising-disappearing mind-event). We can recall our Bhagavan Ramana’s great wisdom: “thoughts are of the mind; yet You are NOT the mind.” This was the supreme advice he gave to enlightened sages like Annamalai Swami and anyone who cares to listen. You, the real You, always stands as Source, right HERE, “upstream” from whatever phenomena are happening “downstream” at the level of mind or body. Hence, there need be no efforts specifically to “get rid of thoughts” (contrary to what is so often given as a preliminary teaching). Just notice thoughts and intuitively, clearly realize you are their ever-free Source. This is the real essence of self-inquiry. So we need not make a problem out of thoughts or a problem out of “the monkey mind” (the bundle of thoughts, memories, plans, associations, etc.). As Zen says, “don’t make anything.” Zen Master Bankei wonderfully spoke it: “Don’t get born, stay unborn (fu-sho),” i.e., no need to get involved in thinking you are someone who has a “big problem” because thoughts are arising! Ramana Maharshi was not a thought-less sage, but a thought-free sage. He had thoughts--so did Sankara and the Buddha and every other true sage. Not egocentric, self-obsessive thoughts, but thoughts of loving-kindness, caring concern, wishing his interlocutors well, problem-solving, addressing issues of ashram living (first up at Skandashram and then at Ramanashramam). Ramana listened to and spoke language, an elaborate form of "thinking." He translated and edited spiritual texts and scriptures, again, an activity requiring a certain amount of careful, precise thinking (not sloppy or wimpy). Maharshi would daily read the newspaper, too, taking note of the thoughts being expressed by reporters and editors--he wasn't just looking at the pictures and advertisements! All selfish thoughts having long ago subsided in his youth, the Maharshi was entirely free to be the great Hosting Presence for all manner of benign thoughts of blessing to spontaneously arise, and with such consummate purity, his thoughts were powerful sankalpas or Divine intentions that came to fulfillment, often in quite paranormally helpful ways. In short, his ego-mind had long ago died during that awakening in his body's 16th year, but now a Divine mind, a quite functional mind, persisted as a form of pure Grace and helpful activity. Ramana was not mentally inert, but fully alive on all levels, including the sagely mind. Again, the essential truth is that the entire cosmos, including your body-mind (thoughts-sensations), is just vibrations. You are the pristine, infinite Awareness always free and clear of the bodymind, clear of the cosmos, and clear of any vibratory state. You are SIVA; all else is the play of your delightful SAKTI. So there’s no need to make problems where none exist. Just be what you are: the glorious No-thing or No-body of pure, spiritual Awareness and witness (whenever you care to) the play of energies. I might add: there’s no need, either, to try and see/witness these energies “clearly,” as in “seeing reality clearly.” Sometimes mind is foggy and confused. Sometimes mind is clear. You, again, are not the mind, You are THIS Reality RIGHT HERE, closer than the mind and closer than the body--the Reality that is always wonderfully, changelessly the SAME SELF, Awareness, regardless of what is occurring with minds or bodies. It’s so funny, really: people would not regard themselves as unenlightened because they have body sensations/vibrations, but if a mind event/vibration arises (a thought, memory or whatever), some overly conscientious, excessively "self-checking" persons think they are therefore unenlightened. All is well, right where you are, as You Are. Who else could be HERE (right where You Are) but the Divine One Who Alone IS? Now, enough of words for the moment. Just see and listen and feel-through all bodymind vibrations, the vibrations of Nature, to their essential “no-thingness.” Even more simply, as Nisargadatta would say: “Just BE, and don’t get ‘restless’ about just being. Just BE” (and “see what spontaneously happens,” as Maharaj would say). This is the purest level of Bhagavan Maharshi’s teaching as well: “Just BE still (summa iru).” And remember: You, O Boundless, Infinite Openness-Fullness, are the Reality in which everything and everyone happens. We can love all and generously serve all by BEING the ONE who is ALL. The Light of Thy Divine Truth is dazzling, O One-in-the-shiningly-beautiful-form-of-Patty! Thanks for the wonderful report in this and your most recent email. I am so happy you are there and doing so well. Just a couple of things. 1) As you continue in Vichara [Enquiry], you will discover that the 'doing' of it will subside and there will be just natural relaxation into Abidance AS Self. Bhagavan: "To ask the mind to kill the mind is making the thief the policeman. He will go with you and pretend to catch the thief, but nothing will be gained. So you must turn inward and see where the mind rises from, and then it will cease to exist." Question: "Is not asking the mind to turn inwards and seek it's source also employing the mind?" Bhagavan: "Of course we are employing the mind. It is well known and admitted that only with the help of the mind (can the [selfish, egocentric] mind) be killed. But instead of setting about saying there is a mind, and "I" want to kill it, you begin to seek the SOURCE of the mind, and you FIND the mind does not exist at all. The mind turned outwards, results in thoughts and objects. Turned inwards, it becomes the Self." Question: "What is the difference between the mind and the Self?" The above excerpts are from: Padamalai, pages 141,142, a wonderful book by Ramana's long time devotee Muruganar, edited by David Godman. It is available in Ramana Ashram bookstore. It is particularly useful in that Ramana's teachings are arranged beautifully by subject. 2) In your most recent email you advised that one should "STOP ALL THOUGHTS" and infer that this is the 'secret step' which will solve the problem of 'Mistaken Identity'. 'I' too tried to stop thought during the early stages of Inquiry. 'I' was not completely successful in this attempt although thought-free moments did and still do appear. I remember the first time thought stopped and it was noticed. It was in 1999, in Thiruvannamalai, while walking between the Pink House and Ramana Ashram. It was such a surprise! The experience didn't last long, only a few seconds. Of course, The first thought that ensued was: "WOW! THOUGHT STOPPED!" The thoughts that followed were all about "my" new and wonderful accomplishment and what this meant about "me". Much later it dawned that thoughts, in and of themselves are not the problem. Thoughts simply come and go. IDENTIFICATION with thought, the unexamined belief that these thoughts mean something about “me”, is now seen to be the sole cause of unnecessary suffering. Thus the questions “WHO Am I?”; “To whom are these thoughts occurring?”; “Out of What are these thoughts arising?” are necessary. You are absolutely correct in your observation that I have not been emphasizing the idea that one should do Self Inquiry in order to "STOP ALL THOUGHTS." It would be a great fraud to tell folks to expect something that has not been completely accomplished by the speaker. Through Ramana's Grace, and the willingness of the Inquirer, it is revealed that The Inquiry Itself is Itself the goal. The Question Itself is The Answer. There is no separation between the Inquirer and That into which the inward Inquiry is directed. The cessation of thought is incidental to this Inquiry; not the goal. These quotations are from Papaji's small book "This" which is derived from the larger book; "The Truth IS". Please make good use of Ganesan [Ramana’s grandnephew at Tiruvannamalai, author and longtime former editor of The Mountain Path]. He is so beautiful and wise. He is indeed your best source now. Listen carefully. He will guide you correctly. Please give him my love and pranams. Finally, Ramana's cardinal invitation and admonition is: "BE STILL, BE AS YOU ARE." ...This is the entire invitation, in six words! Gratitude arises Here. Inquiry continues..... Who believes he is writing this letter??? I am so happy that you both have found your way to Arunachala and the feet of Ramana.